Player of the Year: Natasha Howard (190-C-91) of Dynamo K.
Defensive Player of the Year: Natasha Howard (190-C-91) of Dynamo K.
Guangdong celebrated WCBA title. They outgunned Bayi in the decisive fifth game of the championship series. The game was mostly controlled by Vermilion Birds. Bayi Kylin managed to win second period 19-18. But it was not enough to take a lead and get a victory that evening. Vermilion Birds dominated down low during the game scoring 68 of its points in the paint compared to Bayi Kylin's 48. They looked well-organized offensively handing out 26 assists. Great defensive blocking was one of the keys in this match when Vermilion Birds made 9 blocks. Nigerian-American forward Nneka Ogwumike (189-90, college: Stanford) orchestrated the victory with a double-double by scoring 29 points, 11 rebounds, 7 assists and 4 blocks. 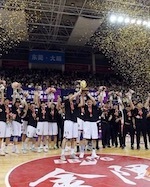 International Sijing Huang (192-96) contributed with 22 points, 9 rebounds and 4 assists for the winners. International Mengran Sun (197-92) answered with a double-double by scoring 18 points, 12 rebounds and 4 assists and center Zhenqi Pan (190-95) added 15 points (on 7-of-9 shooting from the field) in the effort for Bayi Kylin. Both teams had four players each who scored in double figures. Both coaches used bench players which allowed the starters a little rest for the next games. Bayi outscored Guangdong to force the decisive fifth game in the championship series. The hosts trailed by 4 points at the halftime before their 21-12 charge in the third quarter, which allowed them to win the game. Bayi Kylin made 20-of-26 free shots (76.9 percent) during the game. They also forced 19 Vermilion Birds turnovers. Strangely Vermilion Birds outrebounded Bayi Kylin 40-27 including a 32-16 advantage in defensive rebounds. They looked well-organized offensively handing out 30 assists. Worth to mention a great performance of international Meng Li (185-95) who helped to win the game recording a double-double by scoring 30 points, 5 rebounds and 11 assists. International Mengran Sun (197-92) contributed with 22 points, 9 rebounds and 5 assists for the winners. Nigerian-American forward Nneka Ogwumike (189-90, college: Stanford) replied with a double-double by scoring 34 points (!!! ), 13 rebounds and 4 assists (on 15-of-18 shooting from the field) and international center Yueru Li (192-99) added 25 points and 9 rebounds in the effort for Vermilion Birds.